We are proud to host this outstanding concert , This is the last show of the Trail Band, Don't miss it! We are also excited to open our doors at 5:30 for a social time and special guests, Club 22 will be serving beverages. Our Ballroom has a special purpose this evening as well, we offer for $45 a wonderful dinner , dancing and a large screen live video cast on of the concert! There are many ways to make this a very special Monday night! Live music by solo artist during Club 22's Pre show happy hour and acoustic music i The Ballroom with dinner and after the concert for those who want to make a full night of it! 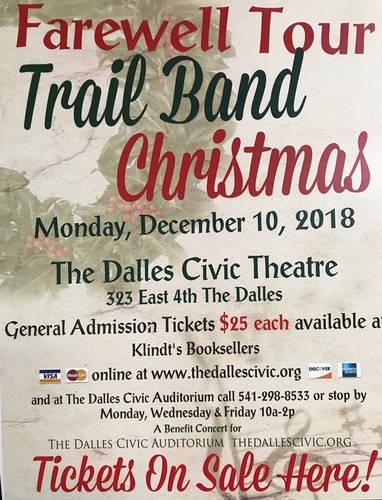 Tickets available at Klindt's Booksellers, online at : thedallescivic.org and also at the Civic center box office noon to 6 pm Mon-Fri.